Celebrating the life and achievements of New Zealand's most famous explorer, the Sir Edmund Hillary Alpine Centre opened in 2007 and combines a fascinating museum and gallery, an inspiring 'Mount Cook' 3D cinematic experience, and the country's first full dome digital planetarium. 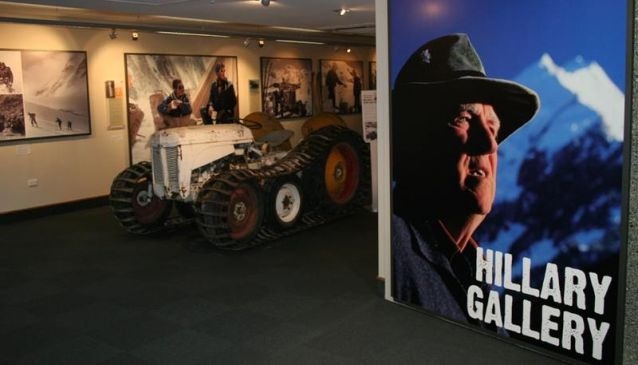 Located beside The Hermitage Hotel in Aoraki/Mt Cook Alpine Village, the museum and gallery traces the unique history of this region and Sir Edmund Hillary's achievements. The exhibits vividly recreate the milestones of Hillary's life and his affiliation with Aoraki Mount Cook. The 126-seater theatre offers an insightful and inspiration documentary of Sir Edmund Hillary, one of the 20th century's greatest explorers. Mount Cook Magic is an inspiring 3D cinematic experience that provides an unforgettable 15 minute journey of the majestic Southern Alps. Be immersed in a thrilling tour from the Maori legend of Aoraki Mount Cook, to flying high above mountains and glaciers, before joining a climbing expedition - all from the comfort of your own seat. The full dome planetarium gives the visitor a 360 degree cinematic rollercoaster ride through our galaxy, black holes, star systems and the far reaches of our universe. The Sir Edmund Hillary Alpine Centre is a must-see stop on any tour of this region. Open daily from 7.30am to 8.30pm (summer) and 8.30am to 6.30pm (winter). BUY AN EXPLORER PASS - includes unlimited entry per person for a 24hr period to all theatre shows.